WASHINGTON — Chrysler Group made the wrong choice in deciding to keep open one New York state dealership and reject another, said an arbitrator who relied on performance data for both stores. The arbitration for Terry Chrysler-Jeep in Burnt Hills, N.Y., may be the first in which comparative operating data, including sales, was used, said the Terry dealership’s lawyer, John Gentile. The data were unsealed last month by U.S. Bankruptcy Judge Arthur Gonzalez. However, it won’t be the last such case, as Gentile’s law firm in Mineola, N.Y., plans to introduce performance figures for its clients and their competitors in two other cases. It is encouraging lawyers representing other dealers to do the same, Gentile said. The arbitrator in the Terry case ruled that Chrysler, which moved to cut dealers last year to match sales with demand, had in effect chosen to keep open a nearby Clifton Park dealership rather than Terry, located outside Albany. 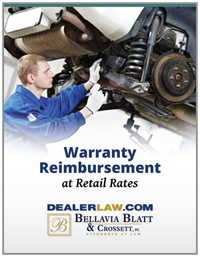 A review of the criteria used by the covered manufacturer to terminate the covered dealership’s franchise agreement shows that the Terry dealership appeared to be a better candidate to remain an active dealer as compared to the Clifton Park dealership, the arbitrator’s June 8 decision said. Arbitrator Larry Biblo compared Terry’s performance with that of the other dealer under a number of criteria. He noted Terry’s superior floorplan status with lenders, its better financial status with Chrysler, its greater working capital and its superior sales performance. Chrysler had chosen the dealership, eight miles from Terry Chrysler-Jeep, due to a perceived difference in the demographic and geographic characteristics of the two, the decision said. That rival dealership eventually went out of business after Chrysler’s bankruptcy last year, and the location remains vacant, the arbitrator said. Chrysler had hoped to turn the Clifton Park store into a Genesis dealership that sells all of the company’s brands. The decision undermines the federal Bankruptcy Court order that affirmed the rationalization process used to reject the dealership agreements, the company’s statement said. Last month, Gonzalez unsealed data detailing each rejected Chrysler dealer’s performance. The judge held that each dealer can get copies of the performance charts of rivals that Chrysler considered for termination. Chrysler said last month it already was producing the data sought by individual dealers, but dealer lawyers said the company was producing only fragments of dealer performance scores in arbitration. The law firm that secured the Bankruptcy Court order, Bellavia Gentile in Mineola, also represented Terry in arbitration. We couldn’t have proved that Chrysler didn’t follow its own business plan in this case without the spreadsheet data, Gentile said. Chrysler said it has fewer than 85 arbitration hearings left.